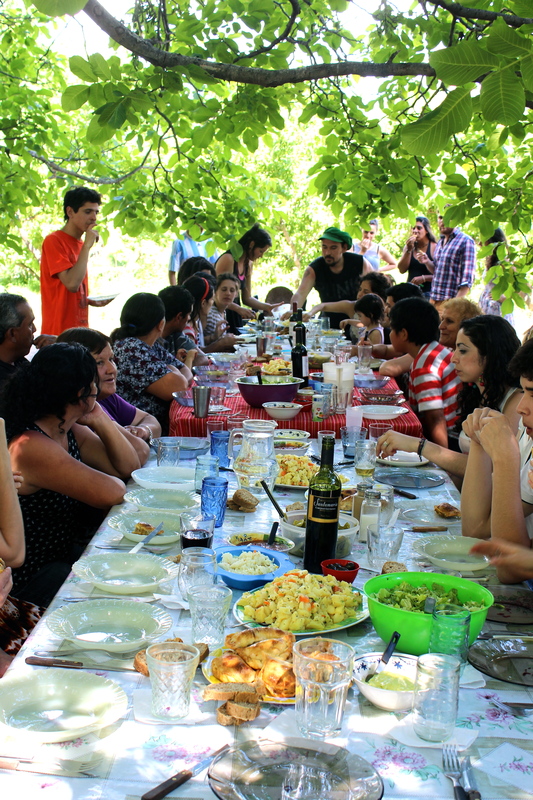 If you find yourself in Mendoza and hear the words ‘la finca’ mentioned in what sounds like an invitation, immediately say “Yes!” or beg your way into an invitation. This is how I found myself taking buses and doing a little hitch hiking with my dear Canadian friend, la artista Carmen and our amigos argentinos, Jorge y Mariel on a glorious Mendocino Sunday. La finca technically means, the farm. 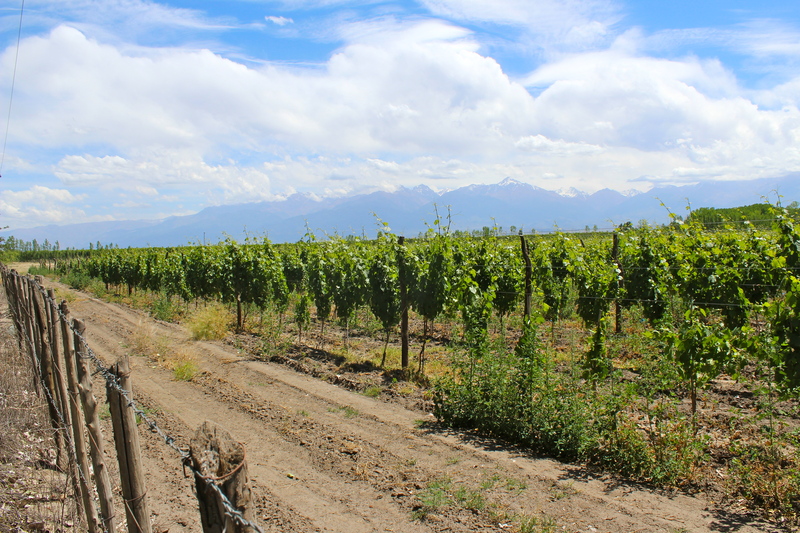 In Mendoza this can often be used to refer to ‘wine farms’, read: vineyards. But it also pretty much guarantees a trip out of the city closer to nature, a cultural experience and a mountain backdrop to top it off. I didn’t know what I was getting into, only that la finca was involved and I was to meet my friends at the bus station at 9:00am. I was still waking up as I made the mistake of buying coffee from one of the little carts in the bus station. Think of it more as sugar water with a hint of instant coffee flavoring. Yikes. My wake up call would have to wait. Luckily our first stop was Mariel’s family house. 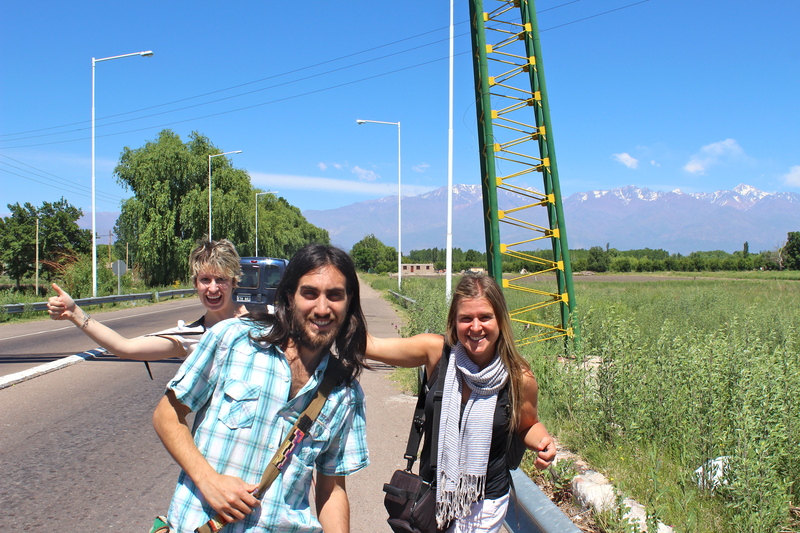 We were dropped off by the bus in the middle of a road and within 5 minutes managed to hitch a ride with a friendly local. 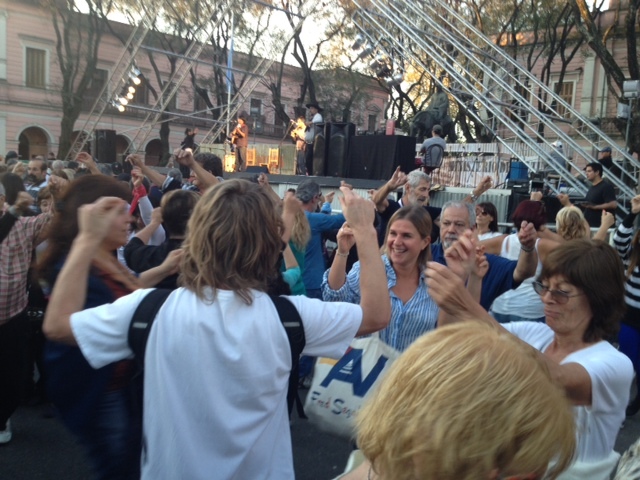 A day of Argentino traditions started. First, it was kisses all around. Mother, father, and then brother after brother appeared from no where to give each of us a kiss on the cheek, just one in Argentina. 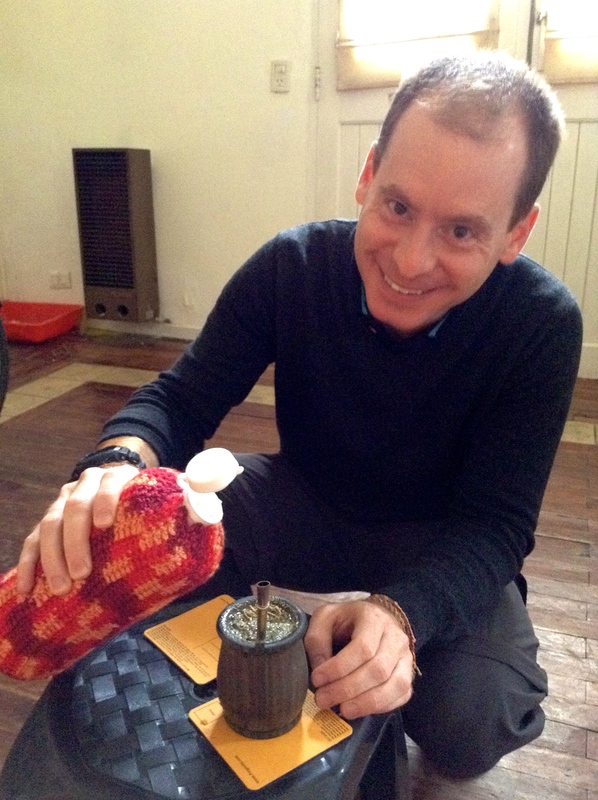 We shared maté, which is a loose leaf tea that you drink from a gourd through a straw. There is a lengthy tradition around this custom, but basically it involves one person pouring hot water into the tea filled gourd and passing it around. When it is your turn, without touching the straw, you drink all of the tea and pass it back to the pourer who will refill it and continue with the next person. On any given morning, afternoon, evening with a stroll through a neighborhood, plaza, or park you can see many a group of friends or family ‘taking the maté’ together. 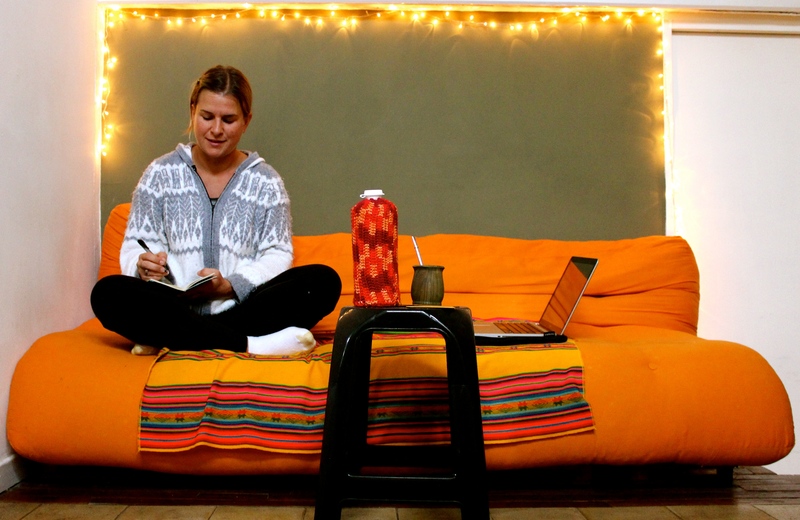 It is thought to be quite energizing as well, so we shared some maté and woke up to the day. From here it was a walk through the neighborhood to catch another bus. But not before a round of goodbye kisses and a run in with the neighbors who we exchanged kisses with, talked to for about 3 1/2 minutes, and then exchanged kisses all around again before taking our leave. Carmen and I looked at each other as if we thought our first round of kisses was sufficient to last at least 5 minutes, but quickly realized by the look on grandma’s face and her extended arm that we were meant to kiss hello and goodbye with even a 10 second conversation. I love this tradition. It seems so strange to me to hold out my hand for a handshake now. 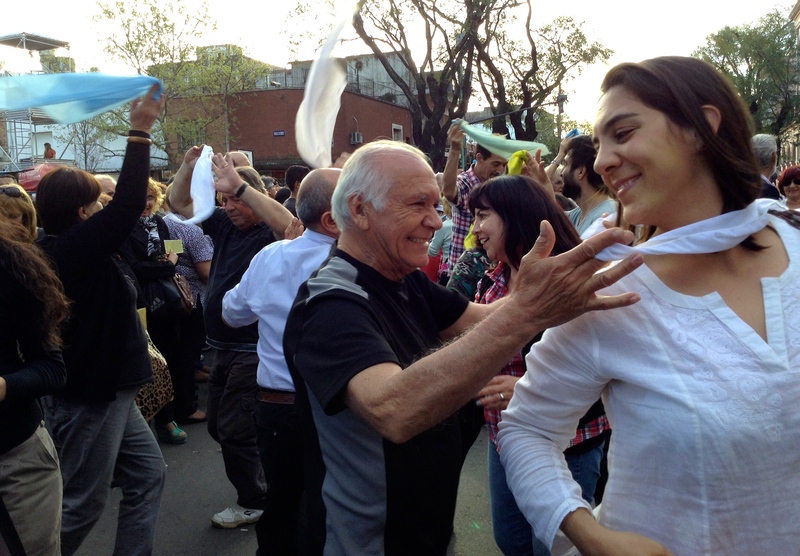 Our next bus took us to another neighborhood where we walked to a friend’s house for another round of kisses and maté. We then piled into their car and headed to la finca where there would be a birthday celebration. 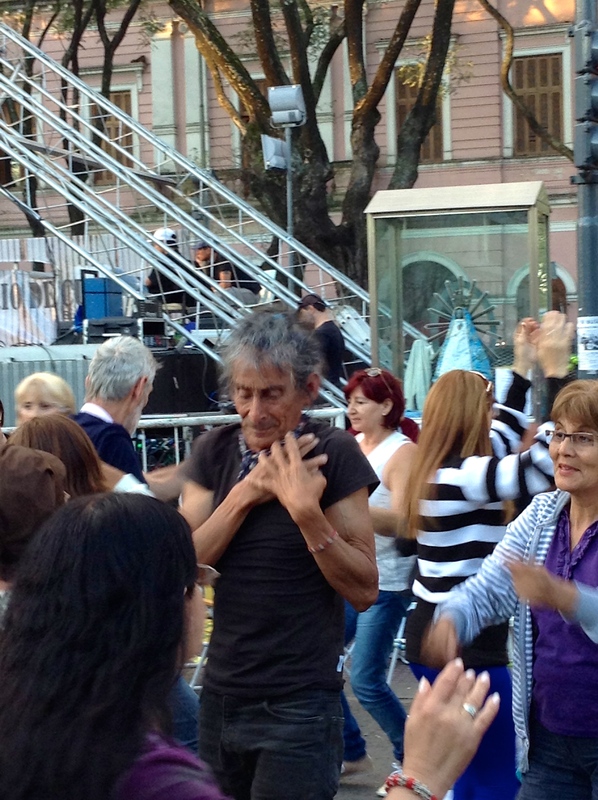 If I only celebrate my birthdays in this Argentine fashion from now on, I won’t remotely mind raking in the years. It turns out la finca that we were visiting is owned by two brothers and one of them was turning 60. There was a vineyard/mountain backdrop just as I had imagined when I begged for my invitation. The brothers themselves had an orchard of peaches and cherries and they grow other produce as well. They host ‘woofers’, which is short for those who are traveling around by working on organic farms in exchange for room and board. There were roughly 60 people there of all ages and countries who, you guessed it!, each came over to give us kisses and welcome us to the party. 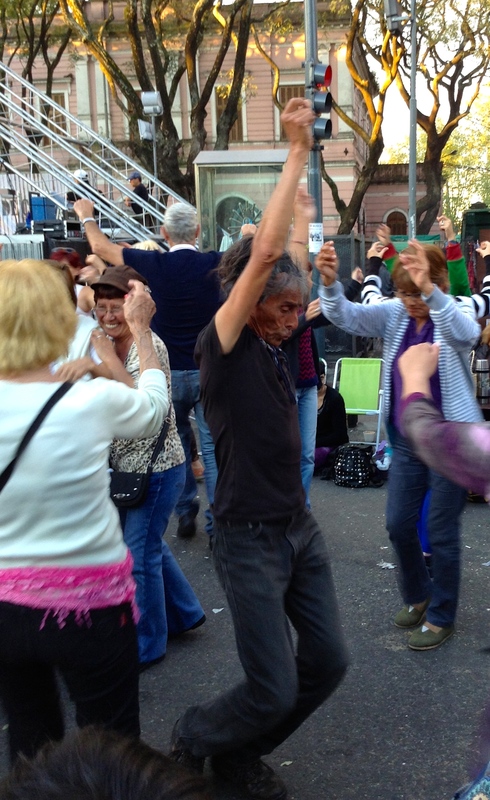 Now it was time for perhaps the greatest of all Argentinian traditions though. 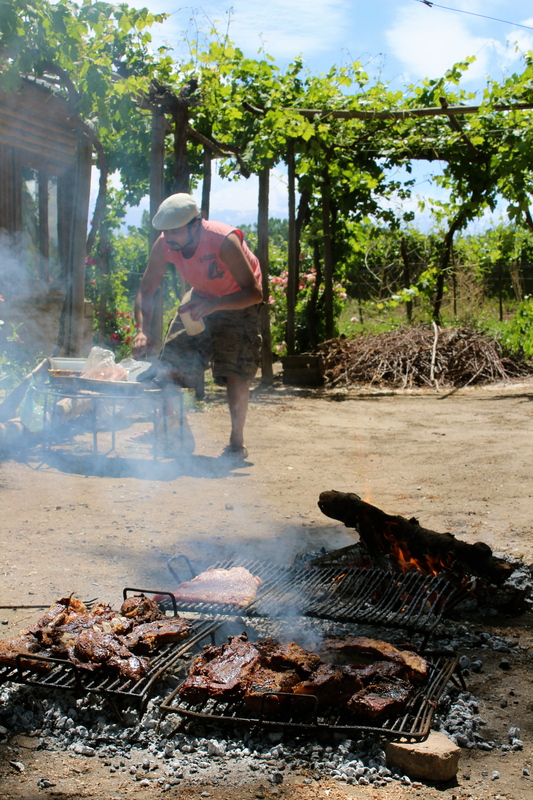 As people played chess, ping pong, bocce ball, futbol or wandered the vineyard, several caballeros (gentlemen) were hard at work tending to the coals of la parilla…the grill of course. Some things are universal! Everyone had brought different cuts of meat and wine and there were also empanadas and vegetables roasting in the dome clay oven. When it was time, all 60+ of us sat around tables that had been lined up into one great table in the shade. And then the food and meat just started coming and coming and coming. In the end, it is tough to say if there was more meat or kisses on this Sunday Funday. We shared many toasts, “salud!” and sang happy birthday and I’m not sure if there has ever been a more content birthday man in history. In my own opinion, sharing a meal like this must be one of the simplest and greatest things you can do in this world. One thing that struck me was how easy it all came together and how everyone was a part of everything. There was this massive meal and not a stress in the world. Serendipity stepped in to give me yet another highlight to the day. I spent hours talking to Rudolfo, one of the brothers who owned the place. It turns out he is a published author and has written many books. 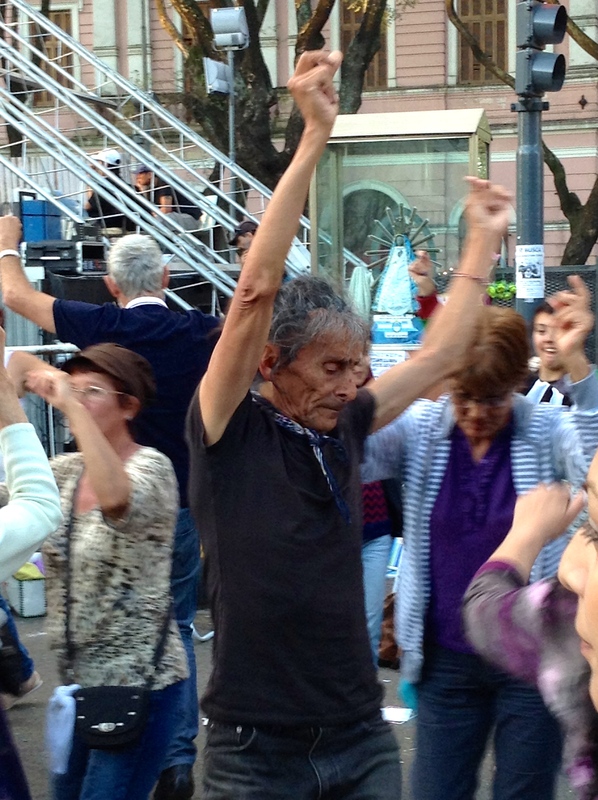 He was thrilled to learn that I had stopped in Mendoza to write a book. We shared writing styles and process and creative inspiration and stories and laughed about how you need to be just a little bit crazy to be an author. He told me to treat writing a book like a fine wine, and I understood why this is the place that I have stopped to write. It turns out that he and his brother had built this place to be somewhere for gathering people in creativity, nature, and company…an amazing display of a vision en vivo. This all took place in Spanish and it was thrilling to understand everything he said and to be able to have what I call a “soul conversation” in another language. We have an open invitation to come out to la finca and definite friends for life as cliche as that might sound. 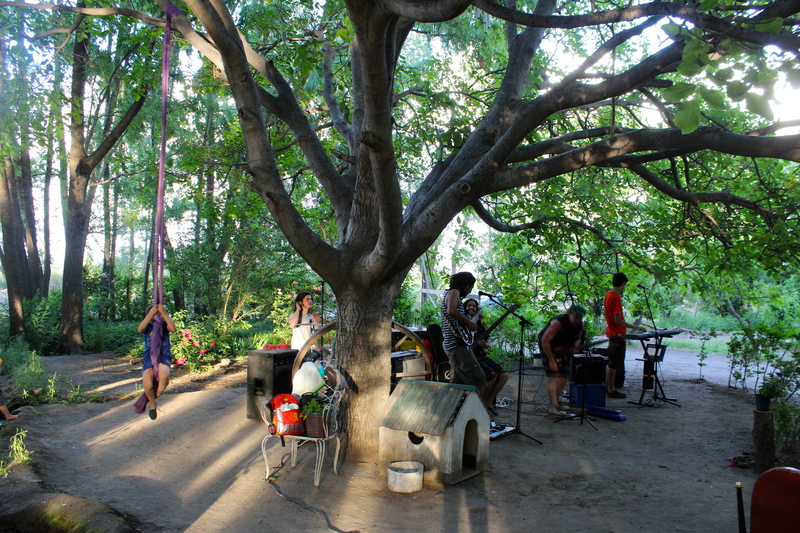 And if this wasn’t enough, day moved into night as the reggae band set up to play alongside the table where people continued to feast. The birthday “boy” himself got up to play the guitar (…what I would consider to be another tradition here. There always seems to be a guitar around and someone who knows how to play it.) 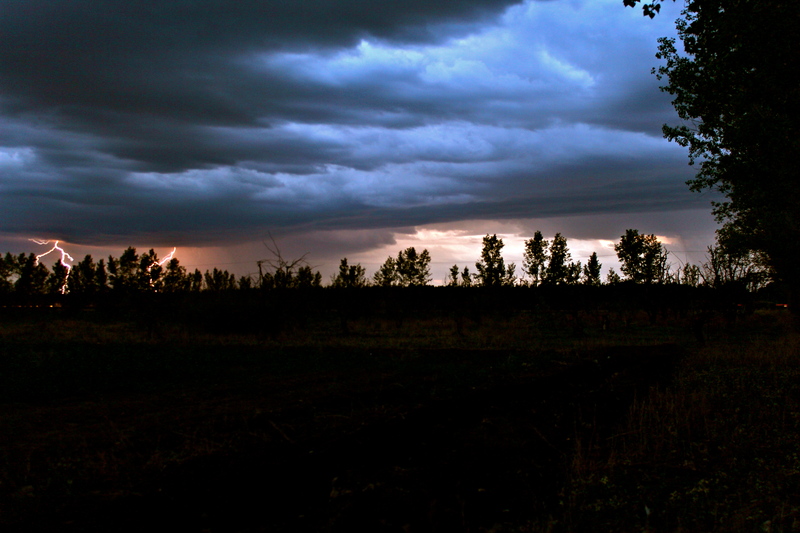 A storm moved in and Carmen and I snuck away to capture some photos of the lightening striking down in a grand finale. This is the sort of cultural experience that I dream of and hope everyone gets a chance to have. I do think it comes from just doing what you love and talking about what you love every chance you get. Connections are formed, invitations are offered, and it all comes together just as it should.